It's hard to be invested in Ubisoft's latest outside of the shooting. In the opening to my review for The Division 2, I openly praised the game for not trying to make me watch too much of its story. Whatever tale The Division 2 tries to tell went in one ear and out of the other, leaving no impression at all—I don't know why anyone is doing anything in that game, really, save for nebulous grabs at power. I compared this cutscene-lite experience favourably to Anthem, which insists you engage with its story to the game's detriment. A few comments in my Division 2 review mentioned that having a poor story should be the subject of some criticism, and I wanted to address that a bit. My larger point was that BioWare's Anthem tried to implement story into a looter shooter, but did so in a flawed way, and siloed that story off from the actual game almost completely. When it did collide with the main game in the form of, say, a mid-mission cutscene, it gelled awkwardly with an experience that was otherwise about shooting enemies in cool mech suits. It didn't help that Anthem failed to make its surrounding universe feel big or exciting—something BioWare's previous games did extremely well. I found The Division 2 to be kind of a relief in comparison, because it doesn't try and distract from being anything but an open-world shooter. Despite BioWare's best efforts, story is not why people play this kind of game, as interesting as deciphering lore is to some of Destiny's players. Don't mind me, just taking a selfie in a town where the people were poisoned to death. I know why I didn't dwell on The Division 2's story in my review: I didn't really care either way. It's not prominent enough that I thought it was worth focusing on ahead of the game's more interesting elements, like its control points or complicated endgame, for example. I won't be generous enough to say 'oh, well the real story of The Division is the one you make yourself—in the Dark Zone!' Yes, the Dark Zone generates extremely cool stories of betrayal, unexpected alliances and, occasionally, being left to slowly die because your teammates can't be bothered to revive you (still bitter about that one). 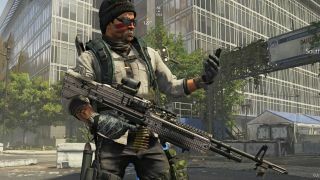 The Division 2 has a bad story because it was made that way. The gorgeous environment and array of things to do are more than enough to distract from that, though. Hence my high score. This is just another Ubisoft game that has a story I'm not invested in, joining most of the Tom Clancy, Far Cry and Assassin's Creed games (except Origins and Odyssey, which succeeded in making its protagonists worth championing). It feels like some of these games go through a tone filter, where anything that could be construed as offensive by anyone is stripped out. You're left with nothing more complicated than bad guys are bad. This, though, is a genre where that approach kind of makes sense. If I thought too hard about why I'm shooting strangers in the back, there's a danger The Division 2 would become Spec-Ops: The Line with moddable backpacks. As it is, the completely dry tone makes the experience of shooting people in this real-world city seem like an oddly passive act—I'm not sure why. Maybe I'm just utterly desensitised, but it feels more like this was the intention of the developers. Making people feel bad about the premise of the game would probably be massively off-putting. I'm not sure The Division 2 would even work if it tried to do that. Those are my thoughts on The Division 2's story, then. It's a thing that just happened around me, like season 3 of Prison Break, or the Val Kilmer movie Red Planet. I'm looking forward to many more hours of using robot bees to murder random soldiers who barely seem to have ideologies. Luckily, the developers know better than to make me sit through a cutscene that's longer than 60 seconds.